You may be familiar with some of the more apparent aspects of the ADA, such as ramps into buildings, blue curbs, and buttons to open doors to offices and stores for those that are handicapped. But you may not be as familiar with ADA regulations that involve the use of horses. Animals can be trained and registered as guide animals, such as a seeing eye dog. But another less-common registration is when an animal is used as a service animal. I knew a law student who received a doctor's note that she had high anxiety and that her dogs help alleviate her condition. With this note in hand the student received registration that her dog was a service animal, and she was able to keep her dog with her in rental apartments that were strictly "pet-free" because her dog helped with her stress disability. New Americans with Disabilities Act regulations say businesses don’t have to accommodate a person with a service animal unless it’s a dog or small horse specifically trained to help the owner, who must have a physical disability. In summary: private businesses (i.e., landlords) are now only compelled to permit animals if the tenant has a physical disability, and the animal is a dog or small horse. While the new regulations have certainly raised numerous discussions, I am particularly surprised and intrigued that it is "small horses" elected to share the guidance category with dogs. Does this make sense to you? That it would be horses and not monkey, birds, cats, or an animal with a little more grip than a hoof? 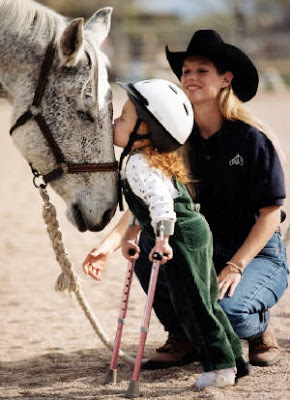 My horses have been a great emotional support to me, and I'm glad to know that if I ever had a physical disability, I would be permitted to register a "small horse" as a service animal in my home--despite often burdensome rental ordinances. One last thought: my gelding is 17.2 hh, where is the line drawn at "small?" My posts have been a little sparse lately; I have been particularly busy at the courthouse, but I have some great posts lined up for you in the near future! And the best equine advertisement video I've ever seen!